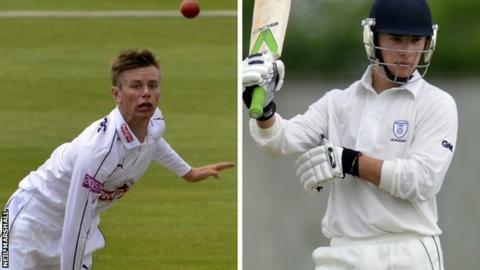 Hampshire youngsters Joe Weatherley and Mason Crane have signed their first professional contracts with the club. Batsman Weatherley and leg spinner Crane, both 18, have both penned two-year development deals keeping them at the Ageas Bowl until 2017. Crane made his first team debut earlier this month in the T20 Blast and his County Championship debut in the current match against Durham. Weatherley captained England Under-19s on their tour of Australia last winter. Crane has also been selected in the England Under-19 Test and one-day squads to face Australia later this summer. "It's great all my hard work has started to pay off," Crane told BBC Radio Solent. "Hopefully the contract can lead to more opportunities in the first team and it's the first step on the ladder to making it. "It's a nice surprise it's happened now, I was expecting it to possibly come at the end of the season."